Going out to a party though means you, the polite and generous reader, should be ready to bring something that’s more than just a bag of chips and a six-pack of whatever beer or soda are on sale. 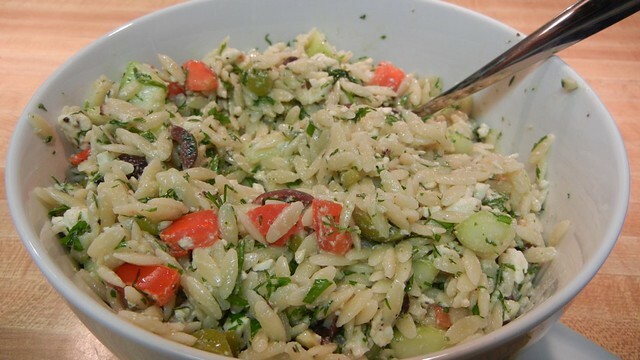 Orzo pasta salad is probably the easiest thing you can make and take to a party. Boil a little pasta, chop up some herbs and vegetables, toss with some oil and lemon juice, refrigerate and you’re done. Goes with barbecue, hot dogs and hamburgers, pizza or anything else your host may be cooking up for game day. 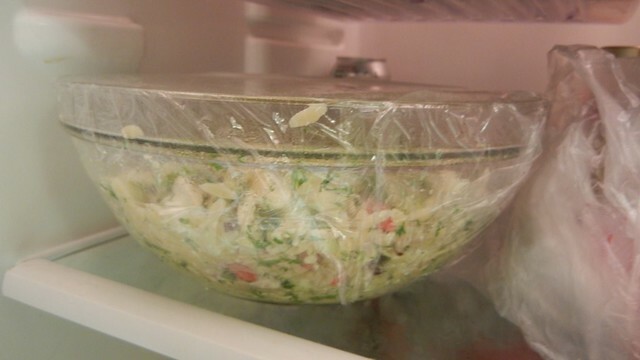 Can be prepared a day ahead of time and since you chill it there is no need to worry about transporting around a hot dish. Easily doubled for a large gathering. 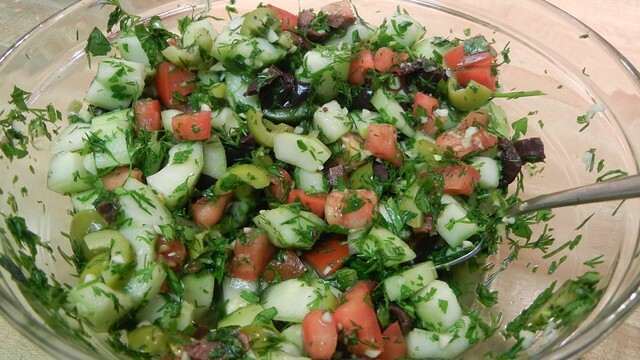 I cannot even begin to tell you how many times I’ve brought this salad to a tailgate, football party, or picnic in the eight years since one of my mother’s Orange County cousins shared with me the general recipe for this dish. I’ve tweaked it some since then, added more olives, and incorporated in some balsamic vinegar, garlic, cucumber and parsley. I can tell you it vanishes at ever party I’ve ever brought it to. I always say 1 rounded cup of orzo because no matter what strainer I use, I always lose some of the orzo along the way. Cook the orzo according to package directions, generally about nine minutes. Set aside the finished orzo to cool for a few minutes in a large bowl before combining with the rest of the ingredients. 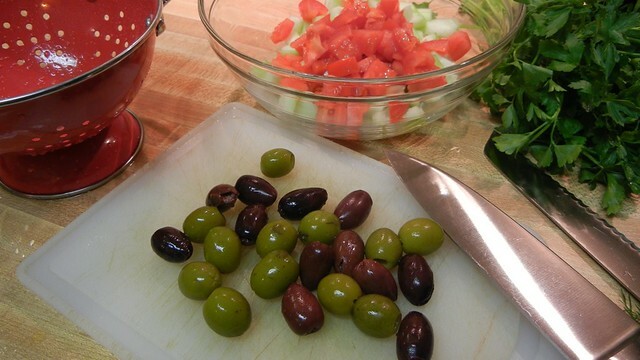 Chop up the rest of the olives, vegetables and herbs and put them all into a medium sized bowl. Stir in the lemon juice, 3 tablespoons of the olive oil, balsamic vinegar, salt and pepper. Set aside until the orzo is done cooling down just a bit. 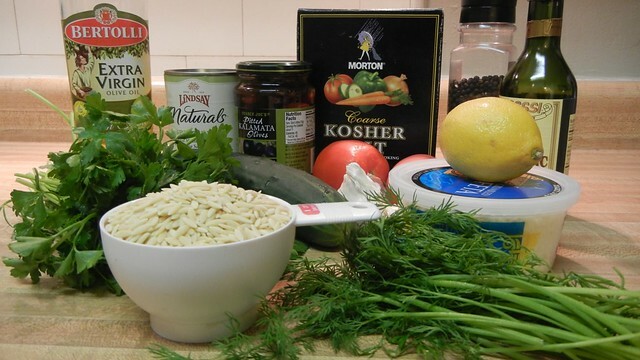 Once the orzo is cool, combine with your vegetable and herb mixture in a large bowl. Fold in the crumbled feta. 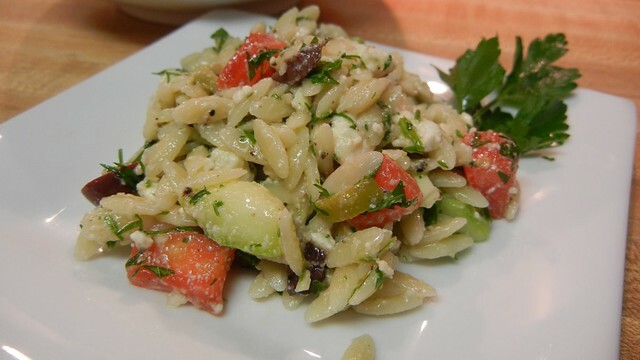 If the pasta salad is a little dry, add in another tablespoon of olive oil. Taste for seasoning and add more salt and pepper if necessary. Cover and chill in the refrigerator for at least an hour before serving. Give a good toss again when ready to serve at the party. See? Easy. Much better than just bringing a bag of potato chips to a Super Bowl party. 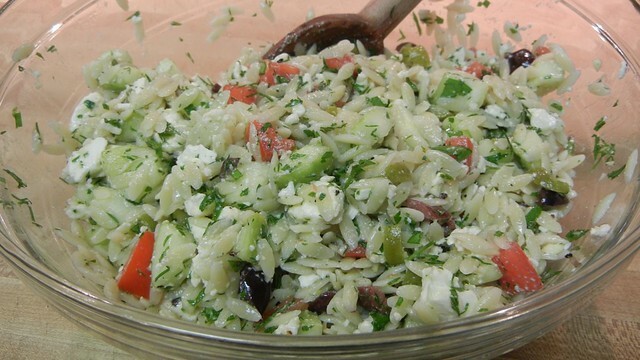 If someone isn’t particularly fond of olives, what could be substituted for it? Hmm… I would steam, cool and chop up some squash. If you like mushrooms, fresh baby portabello mushrooms. Maybe toss in some chopped capers. Roasted red peppers would be good too.